Celebrations in tower blocks surrounding the stadium following 78th minute winner. 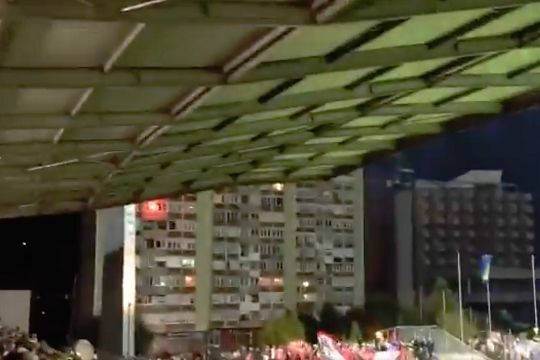 Bosnia and Herzegovina played out their Nations League clash with Austria at Bilino Polje in Zenica, overlooked by blocks of flats surrounding the stadium. The hosts won the League B Group 3 clash on Tuesday after Edin Džeko scored the only goal of the night on 78 minutes. Following the former Manchester City player’s winning strike, a red flare appeared at the windows of more than one of the towers. Bosnia now have maximum points from their first two games, cementing their lead at the top of the group by defeating the Austrians who were captained by West Ham’s Marko Arnautović for the first time.